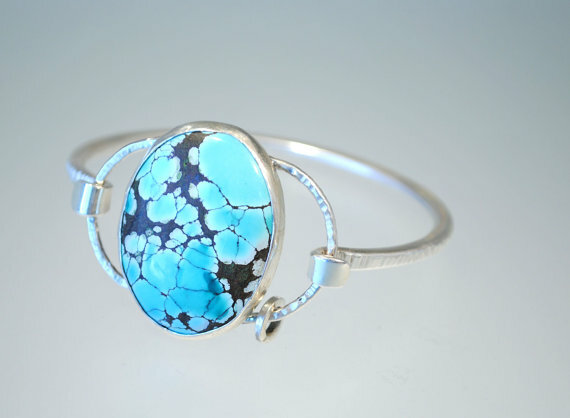 Today’s featured gem, Turquoise, is one of the historically oldest mined gems in the world. It has been worn by many cultures over thousands of years in places like Turkey, Persia, Egypt and Mexico. It owes is name to the French who called it Turquoise since it was first brought to France from Turkey. A few other historical names for the stone can be found including Chalchihuitl in Aztec and Callais in Greek. 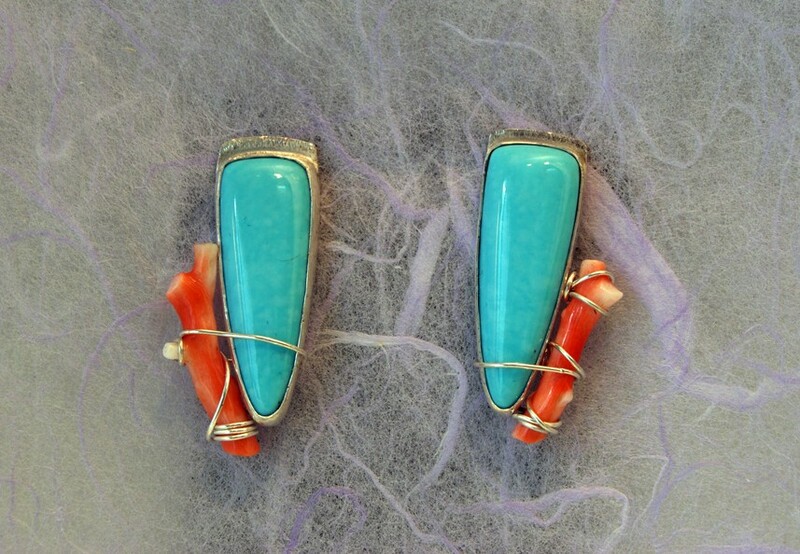 Turquoise is a hydrous phosphate of copper and aluminum that occurs over time when weathering, oxidation and percolating acidic solutions cause these minerals to chemically combine. The blue tones in Turquoise are a result of the presence of copper. Green and teal colors appear due either to dehydration or sometimes the presence of iron. One of the unique and beautiful properties of Turquoise is its trademark dark and somewhat shiny veins which are actually deposits of aluminum, pyrite and limonite. Turquoise is esteemed by many not only for it’s lovely robin’s egg blue color, but also for its waxy opaque luster which differs greatly from the abundance of glassy, faceted gems in today’s gem market and brings visual interest to a jewelry collection. The American South West has long been known to be a major source of Turquoise in the world and the gem has become a staple of South West fashions. Other worldwide sources of the gem are found in the Middle East and in China. Many established Turquoise mines in the U.S. and abroad continue their operations today just as they have in decades past through seasonal, hand worked procedures that use little to no large scale machinery. Since the stone is so greatly loved across cultures and so carefully obtained, it’s likely that jewelry collectors will continue to hold Turquoise in high value for a few more millennia! When I began metalworking a few months ago, I was thrilled with the prospect of developing a new skill set to create more wearable works of art. What I naively did not expect was that I would need to know quite a bit of science before beginning. Time to dust off those eleventh grade chemistry books! So much of working with metal stems from developing a firm knowledge elements and their properties. Remember Au, Cu and Ag, better known as Gold, Copper and Silver? Each of them has unique properties, such as specific melting points, malleability and hardness. I believe that I must have learned this somewhere in my grade school education, but since I had no practical reason to put this knowledge to use, I had since forgotten it (haven’t we all?). But in the workshop, this information is relevant and needed to produce the result you are looking for in a piece of jewelry. Each metal has its own personality and quirks, in a way. It’s up to you, as a jeweler, to learn it inside and out so that you can work with it as a skilled professional. My first lesson that Silver taught me is that it reaches melting point more quickly than I anticipated. Sterling Silver melts at 1640 degrees Fahrenheit to be precise . Silver also has the most thermal conductivity of any metal, which basically means, heat travels through it very quickly. In a matter of seconds, your piece can go from wonderfully shapeable to a rippled mess if you aren’t careful. Having this head knowledge about Silver to combine with the hands on experience of observing the look and feel of the metal as it goes through changes has given me the foundation that I need to gain confidence and be adventurous as a craftsman. My advice to anyone else who is new to metalworking is to spend some time hitting the books to give yourself a good scientific foundation for building beautiful pieces. You’ll be so glad that you did when you see the results of your work! This week in the Rock Review, we’ll examine a stone that looks more like it could be a painting! 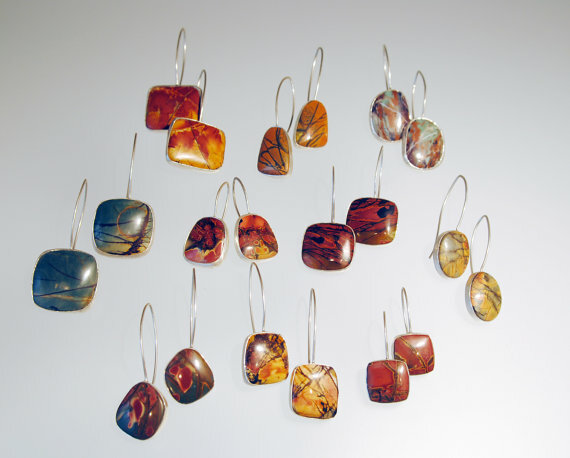 Cherry Creek Jasper is known for its vibrant natural tones that form together creating a result that often looks like an abstract painting of a natural landscape. It has a wide range of color variation in the stone ranging from mustard to an apple red that even sometimes contains hints of an aqua tone or forest green. It’s trademark feature is lines of brown and dark gray that appear throughout this variegation of colors, taking on the appearance of trees or twigs. Currently, this stone hails from China and is available in the U.S. in limited quantity. 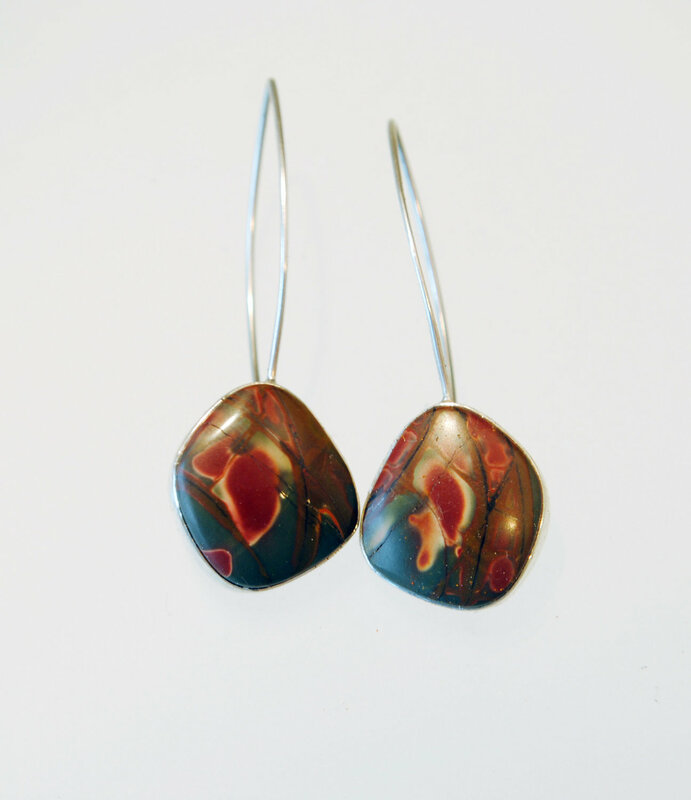 Cherry Creek Jasper is also known by a few other names such as Red Creek Stone and Red River Jasper. In realty, there is some debate regarding the stone’s qualification as a true Jasper because it differs on Moh’s scale of hardness from traditional Jasper. Cherry Creek Jasper scores a 6, while traditional Jaspers scores 7. 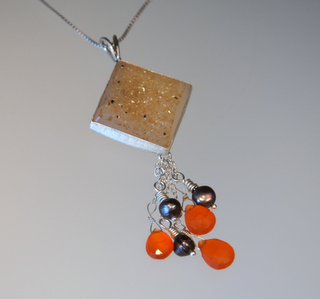 It’s more likely that Cherry Creek Jasper is a type of silicified calcium-based stone such as dolomite. As Shakespeare commented “a rose by any other name would smell as sweet”, and this is exactly our opinion of Cherry Creek Jasper. 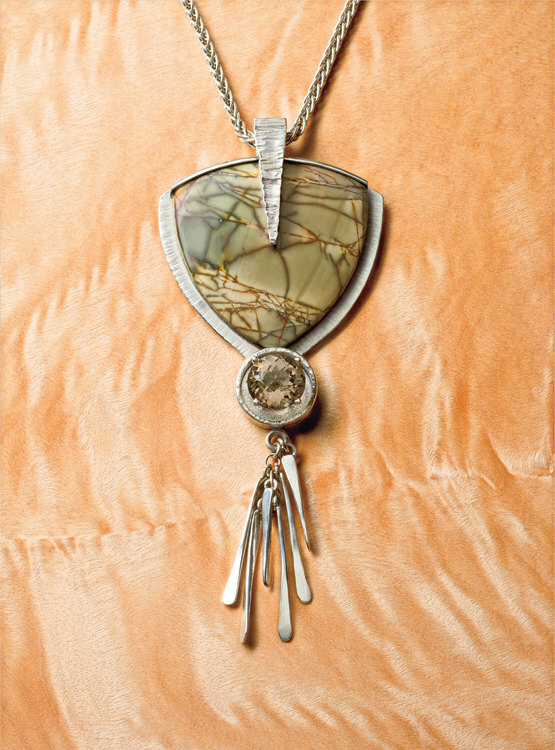 It’s striking colors and unique patterns make it a delight for jewelers to work with and a joy for customers to own. Check out some Cherry Creek Jasper currently available in our shop below! In today’s review, we will take a slight turn away from discussing gemstones and minerals, to bring to you some exciting news from the realm of metals! After all, metal’s do come from Ore, so that means it qualifies for a rock review, right? We have been busy researching a type of silver that is growing in popularity, Argentium Silver. This new alloy of silver has metal smiths everywhere excited get their hands on some and try it out because of the great advantages it provides for artists and customers alike. Argentium Silver is an alloy of silver that combines silver, copper and germanium to produce a result that has many benefits over traditional Sterling Silver. Currently, it is being mined exclusively in North America. It’s name was taken from silver’s original name, which was Argentium (Ag on the periodic table). It is brighter in color than white gold or platinum, almost taking a white tone rather than gray, and is purer than sterling at 93% fine silver. One of the distinct advantages it provides to metal workers is that it has little to no risk of fire scale or scaring left by flames on traditional Sterling Silver. Jewelry lovers are equally excited that it’s a low maintenance tarnish resistant metal. It can even be cleaned with “around the house” items such as cotton towels, tap water and dish soap. It also can achieve double hardness through additional firing, making it a durable material that will last for many years. Because it is more difficult to cast, Argentium is being used via fabrication most commonly through family jewelers and artisan shops rather than large jewelry manufacturing operations. From a business perspective, the unique qualities of Argentium Silver allow those in the handmade industry to reduce labor, processing costs, and environmental impact created by working with traditional Sterling Silver. This is accomplished through eliminating extra processing work and chemicals that are needed specifically in Sterling Silver metal working. Altogether, this means that artisans are able to offer a superior quality silver without raising the overall cost of jewelry for customers. The best news about Argentium Silver for our readers and customers is that Layne Designs is going to begin producing pieces in this new and exciting alloy so that others are able to enjoy the wonderful benefits this metal has offer as well. 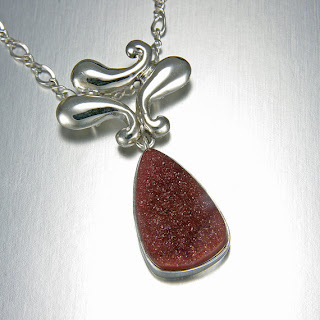 Please come visit the Layne Designs Etsy site in the near future to view some new pieces in Argentium Silver! In today’s segment, we’ll examine Druzy! It seems like it’s been popping up everywhere lately. And why not? It’s a great way to add some shimmer to your summer outfits, whether you are stepping out in the day or night time. Since it often has an asymmetrical shape and of course a raw crystal surface it easily lends itself to bohemian and airy looks that define a summer wardrobe for most women. What a perfect way to bring some uniqueness and personality to your favorite outfits. But what is a Druzy? Are all Druzy’s created equal? How can you make sure that you’re purchasing a quality piece of jewelry that will last? A deposit of Druzy crystals can occur on a great variety of already developed gemstones as geologic activity forces rocks to the earth’s surface where they can come into contact with other minerals and water. This mineral laden water flowing over the surface of the gemstones leaves beautiful unique deposits of crystals over time that can be extracted and fashioned into beautiful jewelry. 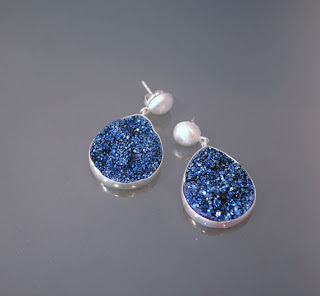 Since Druzy is a crystal deposit that can occur on a wide variety of stones, it therefore can greatly differ in value depending on the worth of the base gemstone and the quality of the crystals. Druzy is commonly found in Quartz and Agate. It also can be found in Garnet, Hematite and Pyrite just to name a few others. Although Druzy crystals are hard, it is important to remember also that they are vulnerable to abrasion. Therefore, when selecting a piece of jewelry, a pendant or set of earrings will tend to have greater longevity than bracelets and rings. Unless of course, the later pieces have additional sheltering through their setting or will be worn delicately or infrequently. Knowing these simple guidelines will help you to choose a piece of jewelry that will be so much more than a summer fling as you fall in love with it again and again each time you wear it! Check out some great Druzy creations for purchase from Layne Designs below. Just in time for spring and new beginnings, today’s rock review features the vibrant, yet soothing Amazonite, known as the hope stone. This pretty translucent gem comes from the Feldspar family and ranges in color from aqua to light green and can often be mottled, including milky shades of brown and white as well. Many Amazonite stones also have what is known as a Schiller effect, or iridescence, due to the presence of Feldspar and Albite that are arranged in very close layers. It receives between a five and six on Mohs scale of hardness. Amazonite can be found many mountainous regions in the world, including the United States, Brazil, Zimbabwe, Russia, Australia, and Namibia. It is uncertain how amazonite received its name. Some sources say it was originally found in the Amazon River and was thus named accordingly. Others attribute its name to the legendary Amazon women warriors, since the stone is thought to inspire confidence, courage, hope and self worth. The stone was especially popular among the ancient Egyptians specifically for these qualities. Today, people around the world are still enjoying this inspirational stone and likely will for many more years to come due to its unique beauty and consistent availability.